Minnie Ella Martha (Geissler) Peace was born June 8, 1933 in Luther, Oklahoma to Gust and Anna (Buerger) Geissler. 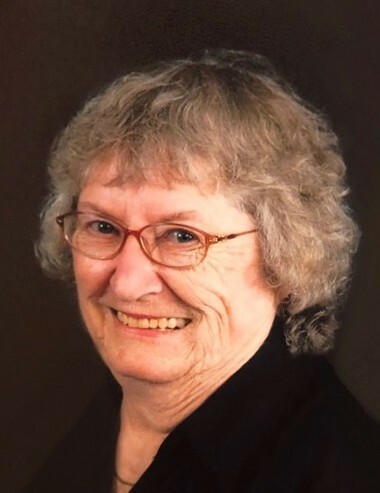 She passed away on Saturday, September 1, 2018 in Shawnee at the age of 85. Minnie was one of nine siblings. She graduated from Harrah High School. Minnie married Merion Floyd Peace on May 26, 1951 in Wellston. They moved to Jones in 1956. She worked in the home, Jones Public Schools, Oak Hill Nursing home and retired from Eastern Oklahoma County Vo-Tech in 1989. She enjoyed fishing, playing cards, quilting, OU athletics, and keeping up with family and friends. She was a very positive person and the simple things in life were very important to her. She and Floyd always showed their love of Jesus to everyone and truly lived for Him. She is preceded in death by her beloved husband, Floyd; parents; brothers, Carl, Otto, Gilbert, Leroy, Ewald; and sister, Helen. Survivors include her son, Ronnie Peace and wife Larita of Wellston; daughter, Brenda and husband Kaiwa Westbrooks of Lindale, TX; grandchildren, Brian Peace and wife Melinda of Oklahoma City, Mandie Peace of Dallas, TX, Jason Peace of Oklahoma City, Kayla Westbrooks of Austin, TX; great-grandchildren, Cody and Kaitlyn Peace; siblings, Laura Mae Crain, Louis Ray Geissler; and many other relatives and friends. The family would like to thank the staff of the Brookdale Assisted Living Center in Shawnee for their loving care. Donations can be made in Minnie’s honor to the Rossville Cemetery, 337958 E 1000 Rd, Meeker, OK 74855. A funeral service was held at 10:00 a.m. on Wednesday, September 5, 2018 at the Mammoth Baptist Church in Meeker with interment to follow in the Rossville Cemetery. Funeral arrangements were under the direction of Lehman Funeral Home of Wellston.